I haven’t blogged much lately, because I’m writing a new book (details to follow! ), but the very nice weather drew me out today to explore a church I’ve not seen before. It required crossing the Strait, so isn’t strictly Anglesey History, but is still a very interesting place. And it overlooks Anglesey! St. Baglan’s Church stands in an isolated position, overlooking the mouth of the Menai Strait, just south-west of Caernarfon. 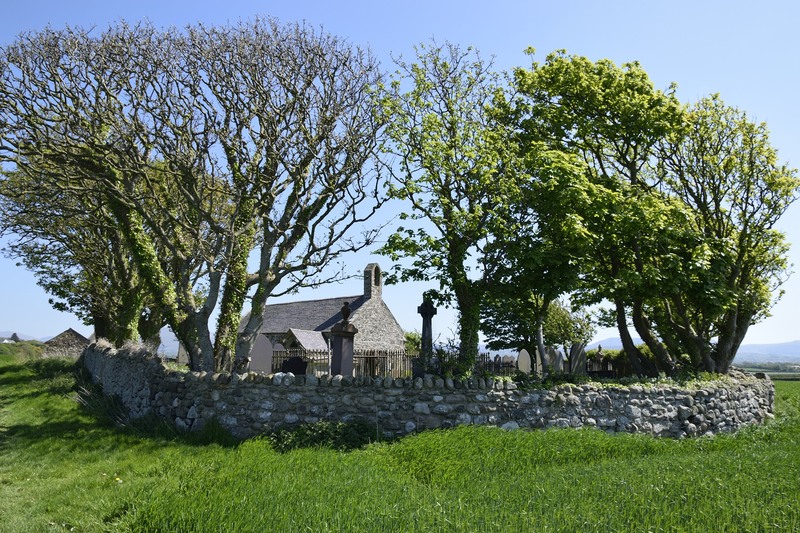 Finding it requires driving down a narrow coastal road, passing Caernarfon Castle across the Afon Seiont on the way, then walking across a field of barley to the church nestled within a grove of trees in an oval-shaped church enclosure wall. Like most medieval churches in Wales, this one, dating to the 13th century, is a small and fairly simple church. 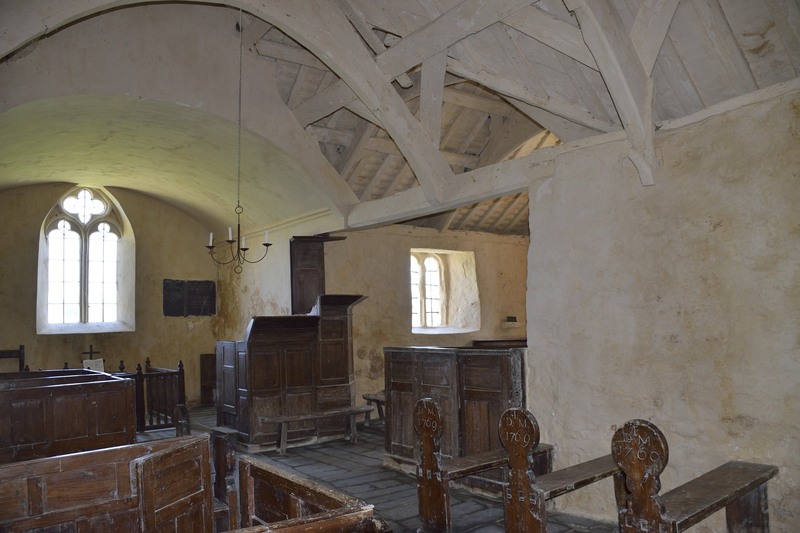 However, unlike most, it wasn’t renovated by the Victorians, so retains its medieval character and the 18th century benches and box pews, many inscribed with names or initials and dates from the 1700s. As a result it was given a Grade I historic building listing in 1968, indicating it is of exceptional interest. It became redundant and in 1991 was taken over by the Friends of Friendless Churches. 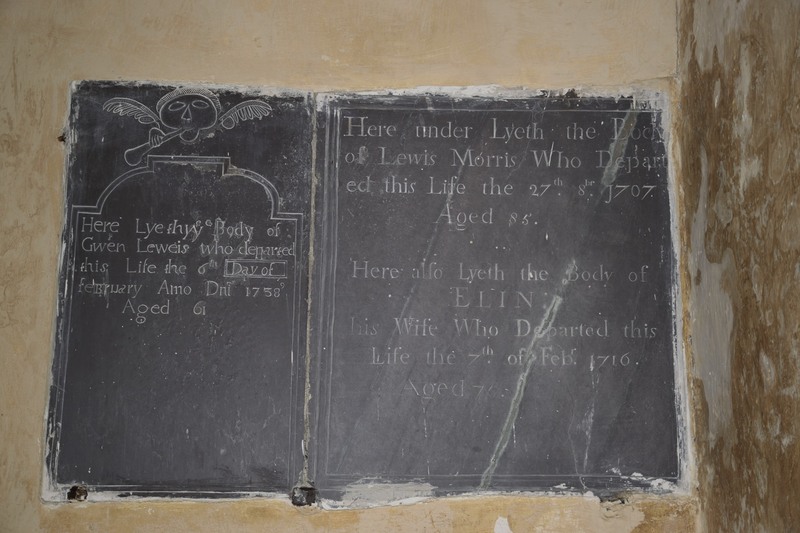 Inside the church are numerous 18th and 19th century memorial plaques and gravestones, and the churchyard surrounding it contains many more 19th century and recent gravestones. 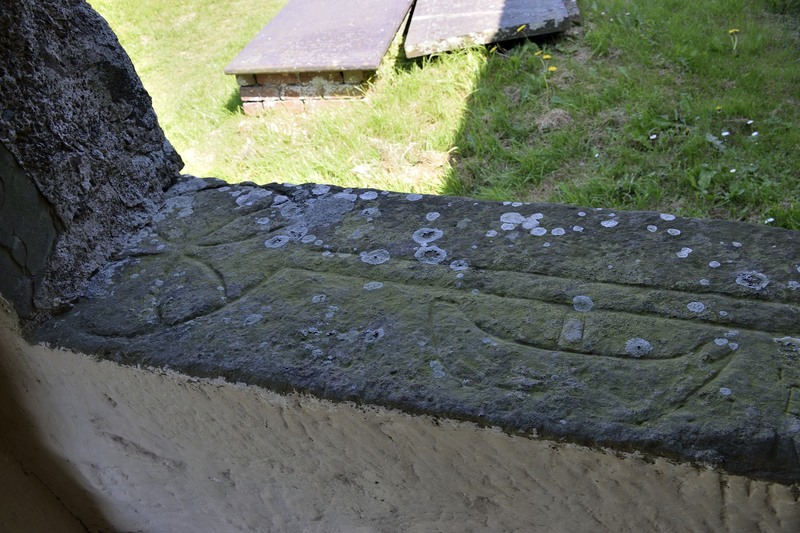 However, the window-sill of the porch consists of a reused gravestone that is probably from the 13th century. It depicts a ship as well as a cross, and may have been the tombstone of a mariner. The most famous internment at this church is a recent one. In January this year the burial took place here of Antony Charles Robert Armstrong-Jones. He is better known as Lord Snowdon, well known photographer as well as former husband of Princess Margaret and brother-in-law of the Queen. The Armstrong-Jones family hailed from this part of Wales and he spent much time at the family home of Plas Dinas, Bontnewydd. His parents divorced when he was young and his mother married the Earl of Rosse from Birr Castle in Co. Offaly, Ireland (a favourite place of mine to visit during my regular visits to the Irish midlands), where he also spent much of his youth. On such a beautiful day there was a steady stream of visitors to this remote church. Some were coming with curiosity like us, others came carrying flowers for their loved ones. Whatever your purpose, this church is well worth a visit. You can find it with this Google Map.